With the recent extension completed, this crown jewel of trails now runs a full 73 miles from Waters to Mackinaw City. A former railroad line that was refurbished and improved with a crushed limestone surface, The North Central State Trail is a haven for bikers, runners and walkers of all ages. The view along the trail showcases some of the prettiest landscapes in the north. Farms, forest and open fields share the scene with sparkling lakes, rivers and marshes buzzing with wildlife. The new extension along Otsego Lake offers even more dramatic views, along with opportunities for a quick dip to cool off. Whether you’re a hiker looking for a daylong challenge, a family out for an afternoon ride, or a trail novice seeking something energizing but not too over-the-top, this trail delivers. Routes from one town to the next and back are great short rides – most are 20 miles or less. Do just one hamlet-to-hamlet jaunt, or combine several for a longer adventure. Just keep in mind that the trail is primarily downhill between Gaylord and Indian River, with a net elevation loss of a very gradual 777 feet. 7.6 miles, round-trip 15.6. Expect to see lots of open farmlands and two unique tunnels. Another photo-worthy highlight is passing under Congdon Bridge, just north of Gaylord. Once you arrive in Vanderbilt, fuel up at the Elkhorn Grill, 8294 Mill St. Open seven days a week, this restaurant is known for its great burgers, pizza and spirits. 11 miles, 22 round trip. This recently completed trail extension runs from Gaylord to Waters, with lovely views of Otsego Lake. Cool off with a quick dip at Wah Wah Soo’s public access site or the impressive Otsego Lake State Park. Along with stunning lakeside scenery, some of our favorite local restaurants are accessible along this pathway, including Porter Haus, Bennethum’s and the newly opened Belle Iron Grille. Once you’ve reached Waters, the Keg Bar serves up tasty dishes and cold beverages. 10.9 miles, 21.8 round-trip. A gorgeous section of trail, this stretch has four miles with no road access as you pass through Stewart’s Creek Marsh. Pause to take in the wildlife and hear musical bird calls. This section of trail also crosses the Sturgeon River twice and the west branch of the Sturgeon near Wolverine. You’ll arrive in Wolverine at the local riverside park. Keep going up the hill to the Whistle Stop, 4853 Webb Road, on the east side of the expressway and across the street from Shultz’s Party Store. Enjoy a full menu, though we recommend one of their delicious sub sandwiches. 9.6 miles, 19.2 miles round-trip. This section of the trail runs parallel to the Sturgeon River, with a nice rustic campground two miles north of Wolverine – Haakwood State Forest Campground – if you’re interested in an overnight stop. Another mile north of the campground you’ll find the Rondo Canoe Access site, where the trail crosses the river. Stop here for a scenic picnic spot or even a swim in the river. Spend some time in Indian River, which is home to Burt Lake State Park. This is still near the trail, which now also connects to the North Eastern State Trail in this location and features a modern campground and beach. Local public shoreline Devoe Beach on Burt Lake is also nearby. Stop for ice cream at Dairy Mart, 3448 S. Straits Highway, across from the trailhead and the local Chamber of Commerce building. A nearby canoe livery, Big Bear Adventures, offers bike shuttle service. 231-238-8181. Featuring 100 acres of woods, tennis courts, paved and unpaved trails for walking, biking and in-line skating, Aspen Park is the answer for family adventures close to downtown Gaylord. Don’t forget to stop by the boundary shared with the Elk Park to view elk, sika and fallow deer herds. The entire park is lit until 11:00 p.m. year round, which means the fun doesn’t end when the sun goes down! 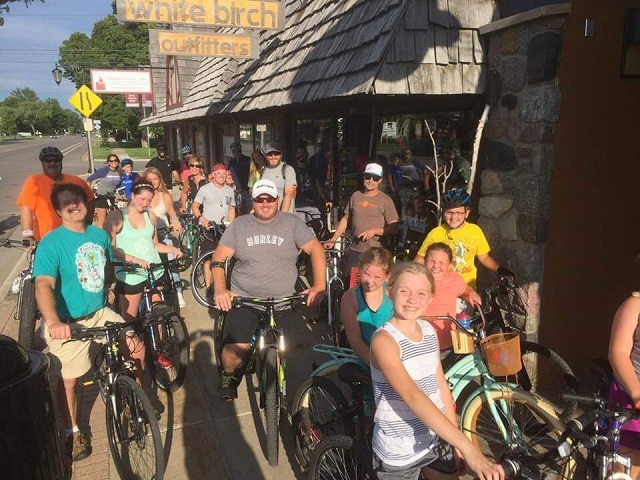 If mountain biking is more to your liking, then you’ll be impressed by the series of undulating trails developed in cooperation with the Northern Mid-Michigan Chapter of Michigan Mountain Biking Association (NMBA). Along with lovely scenery, a quiet pond and natural charm, Aspen Park is truly a must see! Time: Approximately 2 – 2.5 hrs. This route is a part of the former Starker Mann biathlon and includes great scenery! It covers rolling farmland dotted with a variety of trees, crosses the Sturgeon River, has a few challenging climbs and the potential to see lots of wildlife. Park at the soccer fields off North Ohio Street (also the start of the North Central Trail), and head north on Morgan Road. The road winds around to the right and crosses Old 27 North. Cross Old 27 North on to Whitmarsh Road and head due east. This is a nice flat area, and the farther east you go, the better your chance is of seeing elk and deer. Bear right on Winnie Hill Road and you will pass the Smith Golf Course and begin a long climb through the woods. This road will eventually wind around and turn into Marquardt Road, where you will pass Treetops North. Enjoy a long descent and some gorgeous farm country with gentle streams. Stay on Marquardt Road and after a long climb, take a big turn and the road becomes Wilkinson Road. Going right past the main entrance of Treetops, stay on Wilkinson Road until it takes you to M-32 and right back into town. This is a hilly, challenging 26 mile route with plenty of scenery. Riding around Otsego Lake is always fun! You can park at either the Otsego Lake State Park or Otsego County Park. This very enjoyable circular route winds around the largest lake in the County, Otsego Lake. It is scenic and hilly in places, with plenty of views of the lake. You will have plenty of chances to stop on this route, which is about 18 miles long. If starting at the State Park, head south on Old 27 to Mancelona Road. You will then turn on West Otsego Lake Drive, heading north on a fairly newly paved road with nice wide shoulders. It is a bit hilly on this side, where you will also pass Beaver Creek Resort. Follow the large curve, which brings you to Old 27 South. From here, a right turn takes you back to your starting point. Riders will also appreciate the option of taking the North Central State Trail extension running along the east side of Otsego Lake now. If you are looking for an extensive, scenic and relaxing ride with an opportunity to stop for a meal or beverage, then take this route! Bordering the Pigeon River State Forest, wildlife abounds on our south east route. Starting in town, head east on M-32 then take a slight left onto Wilkinson Road. After passing Treetops Resort, you will come to a large curve. Stay right on the curve to remain on Wilkinson Road, which rolls up and down through gorgeous farmland. Stay on Wilkinson until it eventually takes a hard left turn and brings you to the Sparr Road intersection. Turn right on lovely Sparr Road and go for a long distance. At the intersection with Meridian Line Road, turn right. This is a beautiful, but lengthy, uphill climb. Turn right on Heatherton Road to visit the peaceful community of Johannesburg. Consider stopping at The Old Depot Restaurant or Paul’s Pub to refuel. When finished, turn onto M-32 and head south for a short distance. At the large curve, turn right onto Finnegan Road, which eventually intersects at Turtle Lake Road. Stay right on Turtle Lake Road. When you reach the corner of McCoy and M-32, turn left on McCoy Road to head west. Your journey on the wide paved shoulder will take you past Dixon Lake, a picturesque lake with a great public access site. Stay on McCoy Road to the Krys Road intersection, then turn right and follow to M-32. A left on M-32 will return you to downtown Gaylord. It is approximately 40-45 mile route with plenty of scenery and gorgeous farmland. If a short, family outing is what you’re looking for, the Pine Baron Pathway, situated in the Mackinac State Forest, is only six miles from the heart of Gaylord. To reach it, take Otsego Lake Drive west to Old Alba Road, continue west to Lone Pine Road and go north to the trailhead. This system of gently rolling to flat terrain has four short loops which average two miles each. The total outside loop is only 6.25 miles. There are several benches along the way for resting, as well as some nice clearings that are perfect for a trailside picnic. All the trails are clearly marked and easy to follow through peaceful pine forests and mixed hardwoods. Wildlife abounds, so keep your eyes open for the natural inhabitants of the Pine Baron Pathway. Activities at the Groen Nature Preserve include hiking, biking, equestrian, snowshoeing and cross country skiing. This lovely property contains Kujawa and Johannesburg Lakes, along with being the former home to both the Johannesburg Manufacturing Company as well as Echo Valley Resort. Over 11 miles of trails wind throughout this property. Follow M-32 East to Gingell Rd., Turn left on Gingell. The entrance is located at the corner of Gingell and Waters Roads. 2043 Gingell Rd. Click here for a more in-depth look at Groen Nature Preserve. If you would like just a taste of the High Country experience, check out the Shingle Mill Pathway. It is a popular trail system that begins at the Pigeon Bridge Campground, just off Sturgeon Valley Road, 11 miles east of Vanderbilt. The shortest of the five-segment pathway is 3/4 mile and the longest stretches for 12 miles. Trail difficulty increases with the length of each trail, with some steep terrain along the 6, 10 and 12-mile stretches. 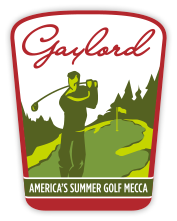 If you have not done any road biking in Gaylord, you are in for a pleasant surprise! With the highest elevation of any city in the Lower Peninsula, over 100 small lakes and the headwaters of 5 major rivers, you will delight in the scenery. The gently (and sometimes not so gently!) rolling terrain offers some of the best vistas and challenging riding in Michigan. Click here for a more in-depth look at what to expect on Shingle Mill Pathway. Who said biking was only a summer activity? With fat tire bikes you can now traverse roads and trails through snow without any trouble. 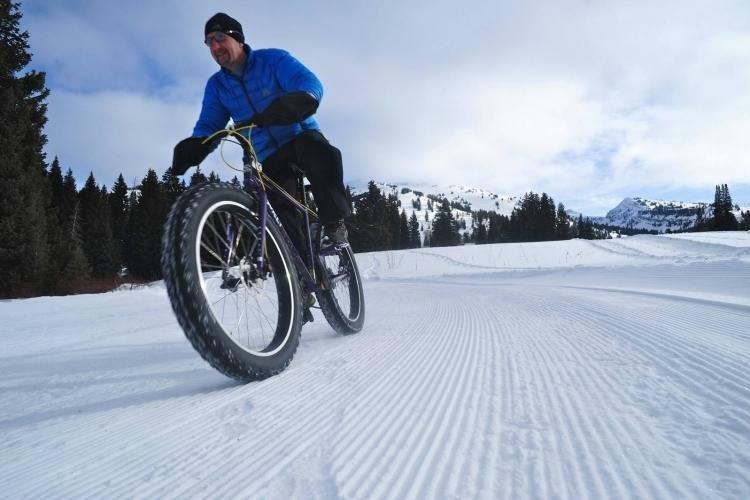 Imagine mountain biking meets cross country skiing! With the additional surface area on the wheels of these bikes, you will be able to bike through most winter weather with much greater ease, provided you bundle up before going out. Fat tire biking also provides additional comfort for the rider by absorbing much of the shock from holes and bumps on the trails. 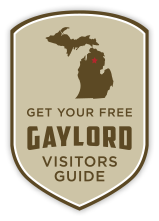 This is yet another great way to experience our one of a kind northern Michigan trails. Treetops Resort rents fat tire bikes and provides a variety of trails right on their main property. Or, rent a fat tire bike from White Birch Outfitters and venture out on your own.